Our school Fete is just over a month away! We have one last request for donations to help keep our costs down. This week when you are doing your groceries can you please throw in one of the following items and hand it in at the office. If everyone donates one item it will make a big difference to our Fete profits which will benefit everyone! We have sent home the raffle tickets for this year's school fete. There are some great prizes which have been donated by some great companies willing to support our school. Tickets are $2 each. If you need more they are available at the office. All tickets are due back to the school by the 21st of September. The raffle will be drawn on the 20th of October. The excitement is building! 2 months until Fete day. The advertising billboard is up and ride wristbands are now on sale at the office. Save $5 by purchasing prior to the day. Yellow wristbands for junior rides are $20 or $25 on the day. 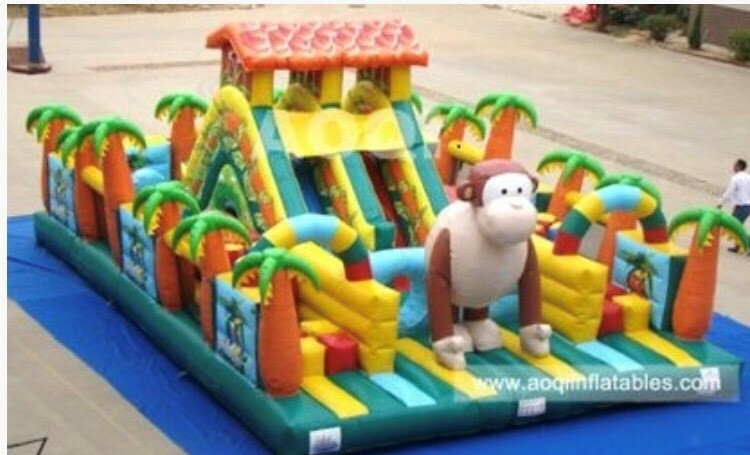 This includes 4 junior rides including the monkey mania inflatable pictured below. For older kids we have a senior wristband on sale for $30 or $35 on the day. Access to all the rides on the junior wristband plus 2 others including the Kite flyer in picture below. Height restrictions are available at the office or contact Kelly. Wristbands provide unlimited rides for the day, so excellent value for money. Good way to entertain the kids while you are volunteering. We are still welcoming hands up to help too!! Our school fete is only 3 months away! The fete is our biggest school fundraiser held every 2 years. To make our fete a big fundraising success we need each family at Oak Park Primary to do 2 things. Please donate one item - we we will be asking for donations in the lead up to the fete of various things (ie. Bottles, sauce, etc). Most items can be bought at the supermarket when you do your weekly shop and one small item donated by each family will allow us to keep our costs down and allow for a bigger profit! Our school community and the support of our families is what makes our school great and we’d love to showcase that to the wider Oak Park Community, so please get on board! All our kids will benefit from the funds raised and we want this to be a massive success. Lock the date in your diaries now, October 20th 2018 and keep an eye out for donation requests and the call out for volunteers on compass. Anyone that enjoys gardening and would like to think about beginning to prepare any plants for this years Fete, we will be holding a plant stall and would appreciate any donations when the Fete comes around in October. Alternatively if anyone has any cuttings they can donate for the students to propagate now they can be left at the office or taken to the sustainability room. We would appreciate if families could donate a bottle of either wine, soft drink, beer, cordial etc for a lucky dip style stall..these bottles will be placed in bags and sold on fete day. Any alcohol will need to be left directly at the office by parents. We will be accepting donations from now until the end of this term. Many thanks for helping make our fete successful.